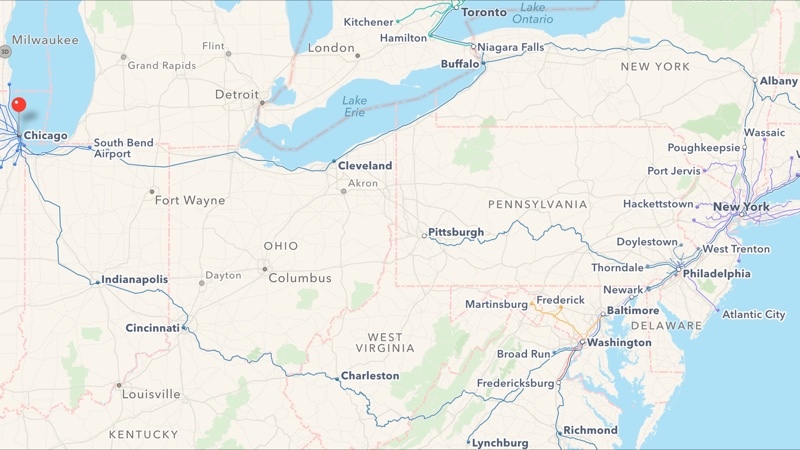 As part of its efforts to add transit directions in iOS 9, Apple has recently updated Apple Maps to include multiple Amtrak routes in the Northeastern United States. Available mainly in the cities where transit directions have been implemented, the longest Amtrak route available runs from Chicago to New York. Supported routes include the Northeast Regional, Acela Express, Keystone, Lake Shore Limited, Pennsylvanian, and Maple Leaf, many of which operate between cities in the Northeastern United States. The Acela Express, for example, runs between Boston, New Haven, New York, Philadelphia, Baltimore, and Washington DC. Lake Shore Limited runs from New York/Boston to Albany to Chicago, while Maple Leaf runs from New York to Niagara Falls to Toronto. Amtrak routes in the South, West, Midwest, and Northwest are not currently available in Apple Maps, but the information will likely be implemented as Apple expands transit information to additional areas across the United States. Transit directions are currently available in Baltimore, Boston, Chicago, New York, Philadelphia, Washington, DC, and San Francisco. Along with Amtrak support for several cities where transit directions are supported, Apple has also added transit information for the Boston area. Boston was initially added to Apple's list of supported cities earlier this month, but the page was later updated to note the feature wouldn't officially be working until a later date in October. As of this morning, transit directions are available in Boston, allowing Boston residents to access directions by Amtrak, commuter rail, buses, and more. The next city to gain transit directions will be Sydney, which was also added to Apple's list of supported cities earlier in the month. While Boston transit information is live, it does not yet appear to be available in Sydney. At least it is tough for a train to get lost. Only a matter of years until transit becomes a useful feature for most users. At this rate I'll be on iOS 30 by the time it covers my area. Why is transit information so slow to be included in Apple Maps? Sorry apple, im not switching from google maps. I use Apple Maps for everything as a default. It is kind of odd considering they bought Hopstop and Embark 2 years ago. Hopstop had directions for basically every US & Canada transit systems. Are walking directions now supported between Chicago and New York? I prefer to rely on my own two feet. Thank you for calling the mapped area Northeast. I've run into so many from this area that say they're from the Midwest, or even West. Nope, you are East, Northeast specifically. I lived in Minneapolis. That's Midwest. Ohio, Indiana, you ain't Midwest.